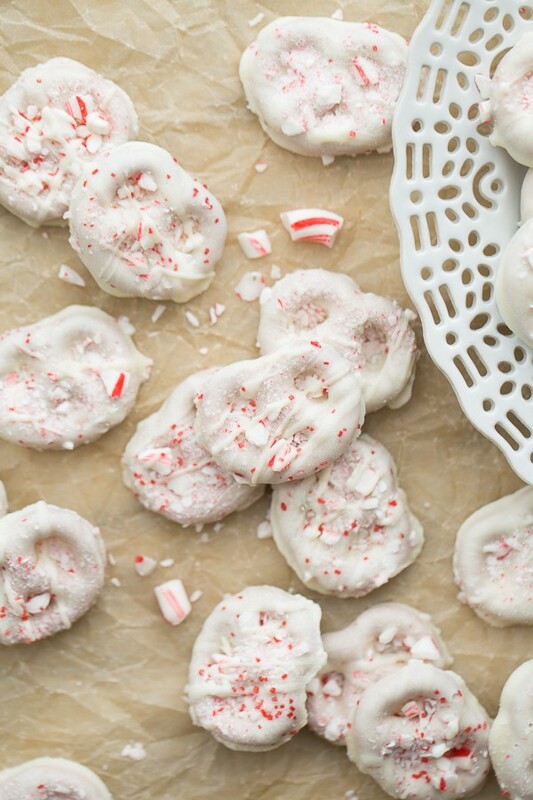 Gluten-Free White Chocolate Peppermint Pretzels! A sweet and salty holiday treat made gluten-free – but you’d never know. An easy and DELICIOUS food gift! 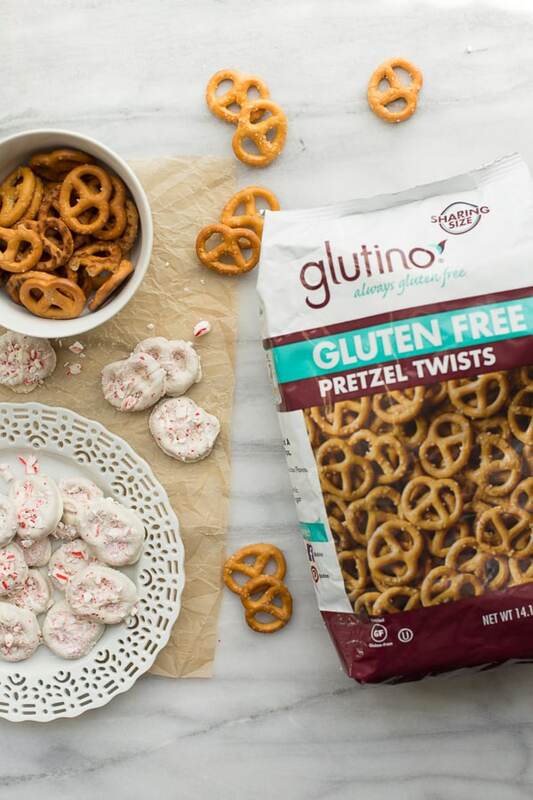 If you eat gluten-free and longingly walk past the bags of seasonal white chocolate peppermint pretzels or pretzel crisps at the store – this recipe is for you! 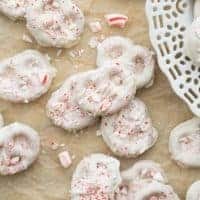 These Gluten-Free White Chocolate Peppermint Pretzels are so easy to make and totally addictive. Something about the sweet and salty with the crunch of peppermint is irresistible! I like to use Glutino Pretzel Twists for this recipe. Nobody will ever guess these White Chocolate Peppermint Pretzels are gluten-free! They also make a great holiday food gift. Once the chocolate has set they are perfect to package up in bags tied with some pretty ribbon. 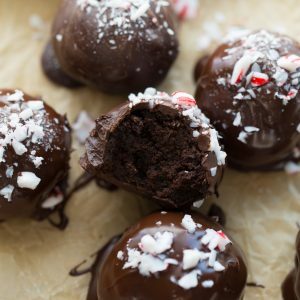 In addition to the crushed peppermint I like to top mine with some red sprinkles and an extra drizzle of chocolate – see the video for how to do it! It makes them extra pretty. Be warned these won’t last long if you don’t package them up. They are so snack-able and addictive they disappear fast at my house! 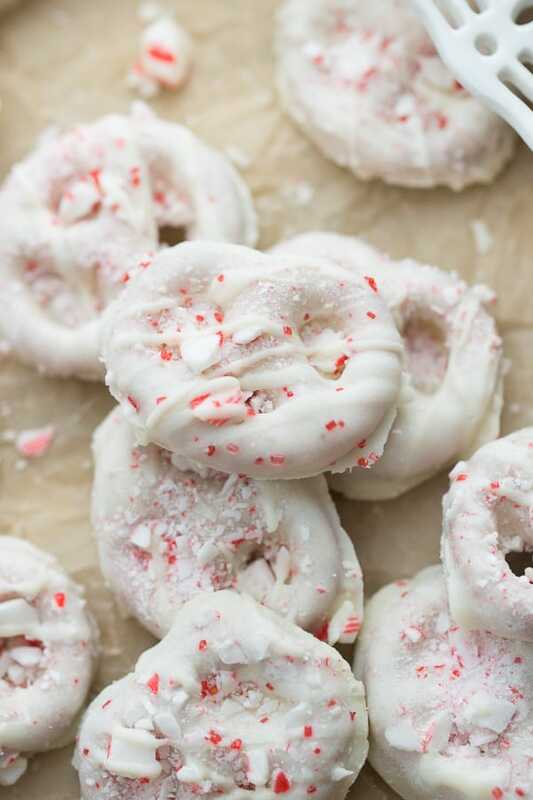 Gluten-Free White Chocolate Peppermint Pretzels! 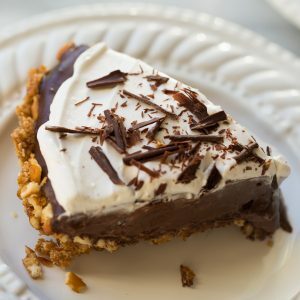 A sweet and salty holiday treat made gluten-free - but you'd never know. An easy and DELICIOUS food gift! In a glass bowl set over a pot of boiling water (or a double boiler) add the white chocolate and coconut oil. Melt, stirring until smooth. Stir in the peppermint extract. Working with 1 pretzel at a time, add a pretzel to the white chocolate and use a fork to coat with the chocolate. Lift the pretzel out of the chocolate with the fork and tap any excess chocolate on the side of the bowl. Transfer to the baking sheet. Repeat with 2-3 more pretzels, then sprinkle with crushed candy canes before the chocolate sets. Top with sprinkles if desired. Let the chocolate cool completely. Break the pretzels apart. Package up for gifts or enjoy right away! These are my FAVORITE treat ever! I could snack on these all day long.. seriously, they don’t last long at our house. 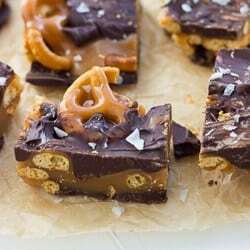 You need to make these this Christmas.